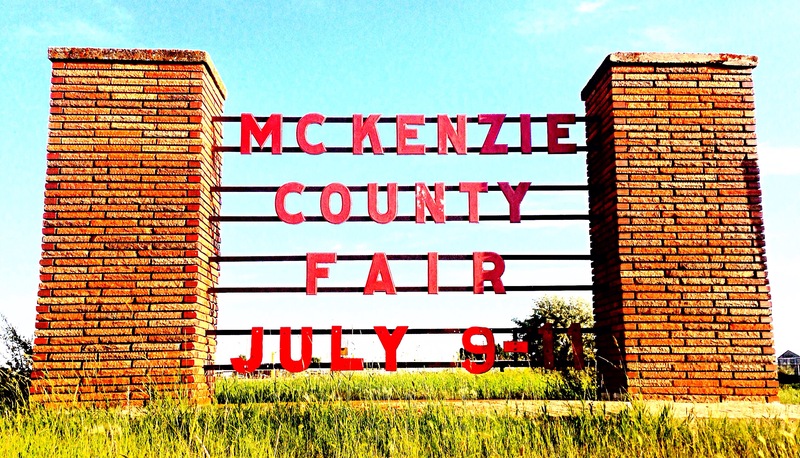 McKenzie County Fair: So You Think You Can Rodeo? It started like many events in Watford do for me, sitting at Larsen’s on a Thursday morning with the ladies sipping coffee. You going to the parade today? They ask me. Parade? I respond. The fair parade, today at 4. Sure, I say, the first I’ve heard of it. I had heard vague mention that the fair was coming but it hadn’t registered as a big deal. It is, I soon realized, a big deal. The Fair starts with a parade down Main Street. I learned from Arnegard that summer parades in this area include lots of big burly vehicles and plenty of candy. The sign reads, “Class 1940, 4 left, Lillian Bergen, Henry Wisness, Roald Hogen, Arnold Holm, 50 in Class”. The children loved getting candy. Getting ready for the demolition derby. Our wonderful Veterans saying hello. And, of course, Benjamin’s favorite – the wee-ooo wee-ooo. The parade majorly clued me in, the Fair is cool and I need to go. After a sleepy winter it is hard to get used to all this partying. These North Dakota’ns cram so many events into the short summer! One word: Crash. Said by my two year old over and over again. Getting high centered during the derby. I’ve never been to a demolition derby before, but Benj was right, it can be summed up in one word; CRASH! With names like Rusty Dagger, Hoss, RIP Jerrycans, Hill Billy, Go Ger Broke, and General Lee, it is no surprise that none showed a bit of hesitation before ramming into each other. Pure happiness from my boys. The fair had too much going on to talk about it all here but you’re getting the idea. Just a could of kids. ha ha get it? Guests grabbing some refreshments sold out of a big blue bus. This table was made by a 13 year old! I’m sure Big John was happy to be here. Bikers Against Child Abuse. Ben got a sweet temporary tatoo and a seat on a real hog. So many things pulled at my attention but what really captured me were the kids. 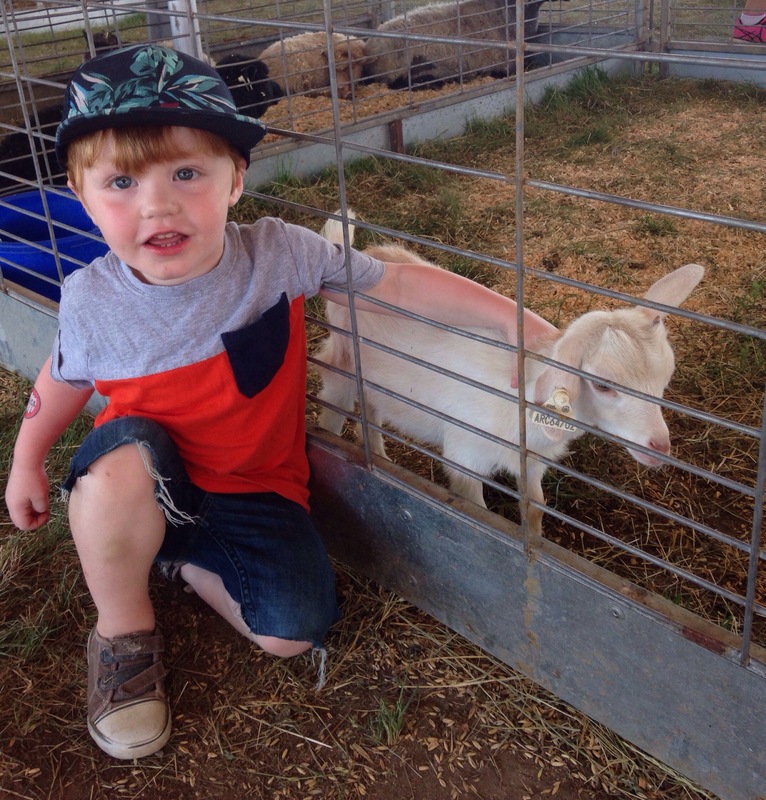 The Western North Dakota kids show up for the McKenzie County Fair. Whether it be participating with 4-H, entering their crafts and baked goods or maneuvering a powerful horse in the rodeo, these kids know how to dress the part and completely intimated me with their ranch-hand prowess. This guy was so cool, nonchalantly waiting his turn during the pole bending event. 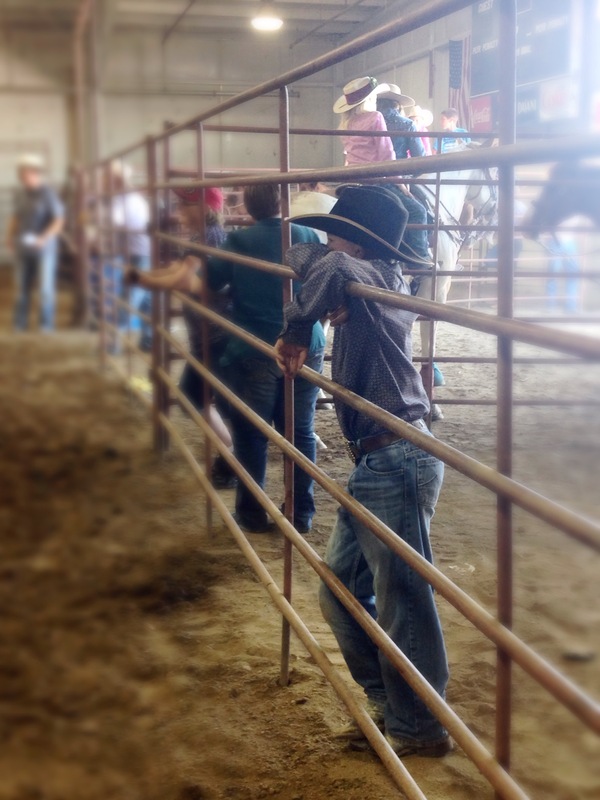 A cowgirl awaiting her turn in the arena. I think she would get an approving nod from Rosie the Riveter. Don’t get me wrong, they seemed to be just as goofy as any kid I’ve ever known, just had a bit more swagger. This guy yelled at me for taking a picture of him struggling to get on top of his horse, I couldn’t resist. 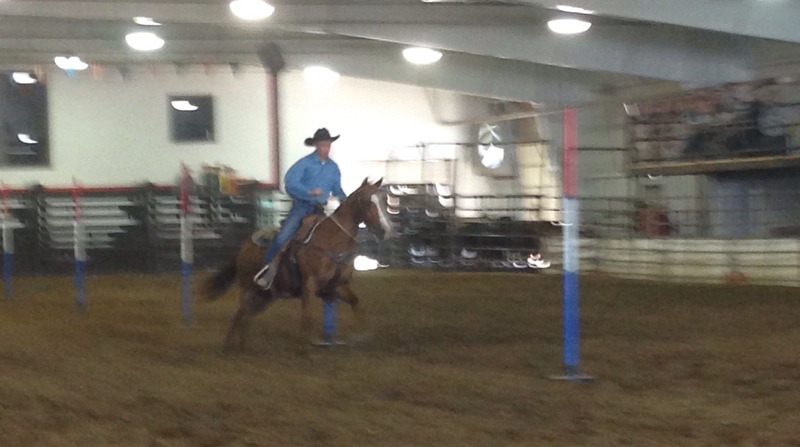 Just doing a little pole bending at the rodeo! I’ve probably been on a horse 3 times in my life. Always with hesitation and always feeling like the one along for the ride, not the one in control. So seeing these adolescent kids jumping right up on big horses and maneuvering them around the arena while running blew my mind a little bit. 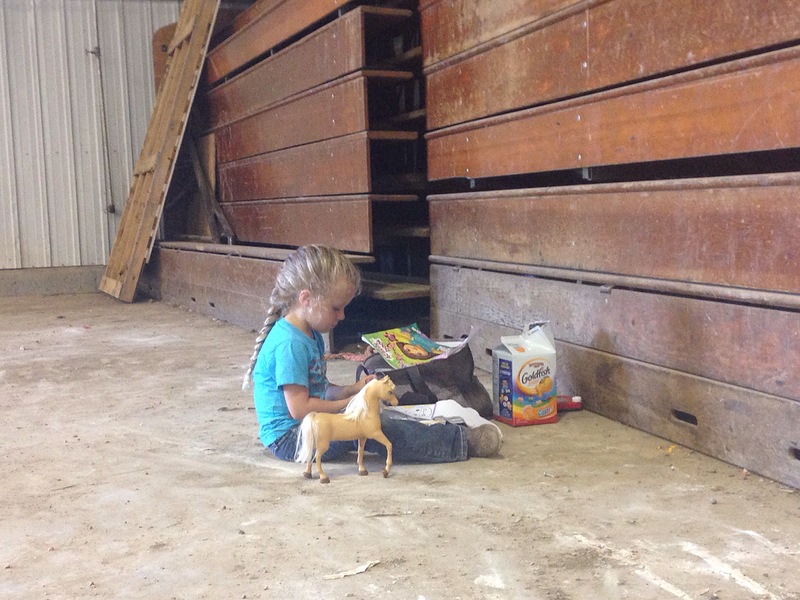 One of my favorite pictures of the weekend was of this girl, playing by herself during the kid’s rodeo. Not yet big enough to be on one of those horses, I can bet I know what she was drawing over there. This childhood, running horses at the fair, is so vastly different than the childhood I lived. The activity, that is. But the sitting on the sideline, watching my older brothers and sisters do something that I desperately wanted to be old enough to do and eventually did do. That, is not so different. A certain amount of brain washing goes on in most families. Are we a soccer family or a rodeo family. Do we value music or extreme sports or literature. I loved looking at the kind of kids this area is breeding; hardy kids, kids who aren’t afraid to jump on horses, kids who knit or sew or raise goats. The kind of things that I, frankly, didn’t know children did anymore. That is a cool kind of kid. 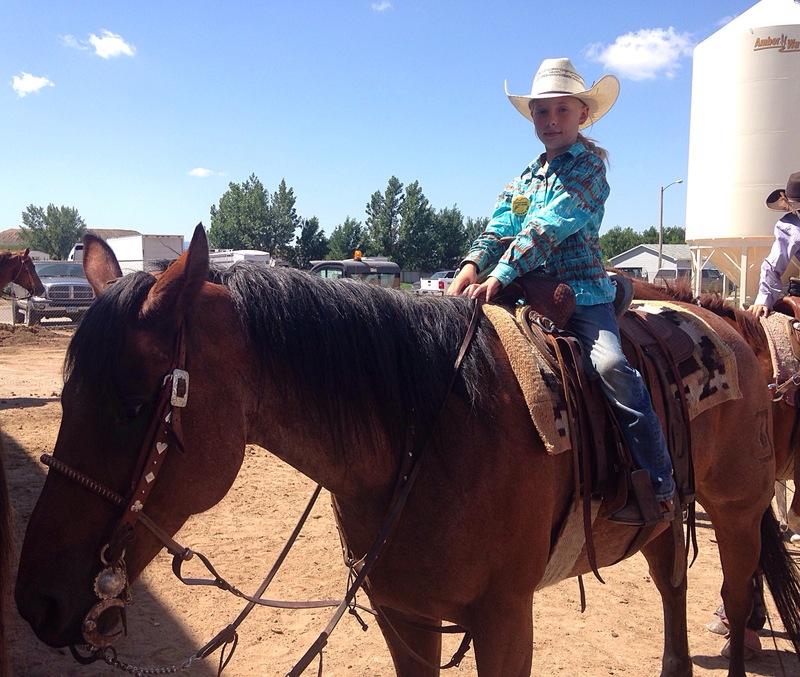 This entry was posted in NoDak Livin and tagged McKenzie County Fair, Rodeo Kids, Williston Bikers Against Child Abuse, Williston Shriners Club by bebadoozie. Bookmark the permalink. Betsy that little cowgirl picture is perfect! I didn’t realize you moved here when you were 16! I Guess because you fit in so well with everybody! Just like you are doing there!! Keep writing I love to read about your adventures! She’s so adorable right?! Thanks for reading Cindy, miss you guys! !